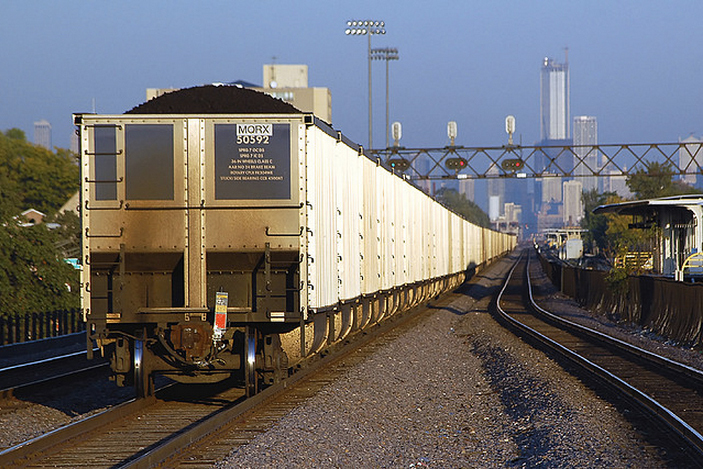 A coal train outside Chicago in 2008. The last barge carrying coal to Pilsen’s Fisk Power Plant lumbered up the Chicago canal in late August, dumping a final 1,500 tons of coal to burn in a community whose members were more than happy to see their industrial neighbor go. Before they shut down, the Fisk and Crawford coal plants were among the state’s largest emitters of toxic chemicals. In 2010, the latest year of data available in the EPA’s Toxics Release Inventory, the power plants were among the leading sources of barium compounds, hydrochloric acid, hydrogen fluoride, mercury compounds and sulfuric acid. A 2002 Harvard School of Public Health study linked the plants to 41 premature deaths and 2,800 asthma attacks annually. It has been a little more than six months since the plants closed, and recent tests by the EPA showed particulate matter concentrations and radiation levels typical for Chicago in the area around Fisk. The readings came from four stationary sensors and a mobile unit mounted to a baby carriage to make sure no odd winds swept pollution between the reach of the monitors. “Overall it’s not unreasonable to expect some air quality improvement since the plants closed,” said the state EPA’s Andrew Mason. There is considerable lag time in analyzing air quality data, and on a regional basis it is difficult to single out individual sources, Mason said, so a definitive breakdown of just what impact the plant closures had on Chicago’s air quality doesn’t exist. But anecdotal evidence abounds. Sulfur oxides can smell like rotting eggs — an aroma residents are happy to report no longer lingers over their neighborhood. Those compounds, along with nitrogen oxides, also contribute to smog and haze. The recent tests seemed to confirm the shuttered coal plants were no longer an air quality concern for neighborhood, but coal is not the only source of particulate matter pollution. A new study in the European Respiratory Journal found 14 percent of chronic asthma in kids is caused by car exhaust — in the same range as the 4 to 18 percent bracket of childhood asthma cases resulting from exposure to second-hand smoke, per World Health Organization estimates. It was the first time they estimated the percentage of cases that might not have occurred if Europeans had not been exposed to road traffic pollution. Around the region, coal plants are struggling to compete with low natural gas prices and tightening EPA restrictions. Dominion Energy, which recently sold off some Chicago area holdings, just settled to the tune of more than $13 million to resolve Clean Air Act violations. The settlement required Dominion to spend $9.75 million of that on environmental projects, including land acquisition and restoration near the Indiana Dunes National Lakeshore. But two coal plants in Will County are not among the more than 100 coal plants shuttered nationwide in recent years. A Romeoville plant emitted more than six million metric tons of carbon dioxide equivalent in 2012, according to the EPA’s greenhouse gas inventory, making it the biggest carbon polluter in the Chicago area. Midwest Generation, which owns three operational coal-fired power plants in the area, last week won a two-year reprieve from new sulfur dioxide emissions standards in light of its December bankruptcy filing. While coal’s share of the U.S. electricity mix has fallen markedly in recent years, it remains a major source of electricity. Coal-fired power plants collectively produce more pollution than any other source in the country. Chicago&apos;s recent decision to aggregate electricity purchases gave coal the boot from the city&apos;s fuel mix, in a nod not only to the decades of environmental concerns that sped the closures of Fisk and Crawford, but to the flagging economic profile of the fuel source whose command of the country&apos;s electricity portfolio is beginning to wane.